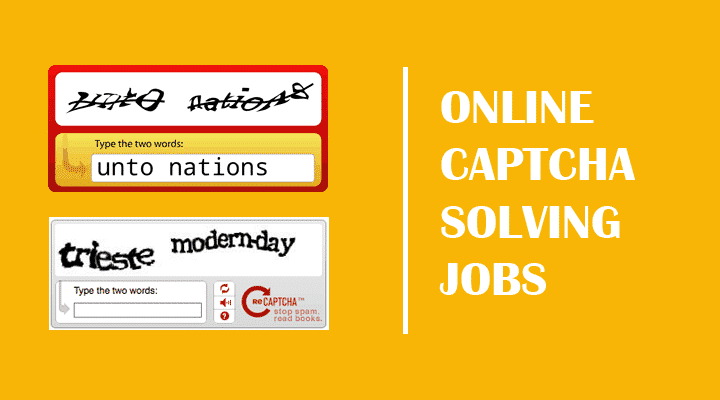 If you are looking for online jobs then captcha entry work is one of the best job you can try. There are hundreds of sites where you can work as a Captcha solver but only few of the sites pay genuinely & regularly to their members. We have checked the review of some of the websites including Captcha Club, 2Captchs, MegaTyper etc & based on the ratings, we have selected some of the top captcha work sites where you can join and make decent (if not much) money. So what is Online CAPTCHA solving Jobs & how to earn from this? I am sure you have at least basic knowledge of internet if you are reading this article. And you must have account on sites like Facebook, Gmail, Yahoo etc. If you have joined any of the site like above or others on internet then you must have experienced the Captcha. This is a human verification test so that no automated bot or software can join their site. Just see 2 different examples below to understand this better. There are many companies who need to signup in large quantities on thousands of websites on internet. They can create the automatic software to signup on the websites but there is no technology to solve these captcha automatically. And that is where they need human to solve these Captchas. When their software create accounts on these sites, they come across Captcha & send that Captcha image to the Captcha solver. You have very short time to enter the exact characters provided in the image & you must have good accuracy to solve these images. And that is where you can earn money from these online jobs from home & that too without any investment. Captcha Solving is a perfect online data entry jobs from home. There are around 10 best sites where you can join as a Captcha solver & earn around $0.5 to $2 for every 1000 captchas you solve. I have collected these online captcha work sites after getting the review on many different sites. Many of the people have worked on these sites and making extra income by working from home. So you too can earn from these online jobs without making any investment. If you are interested then check these 8 sites below, join them one by one & start solving the Captchas. MegaTypers is one of the best online job website where you get paid from $0.45 to $1.5 for every 1000 word images typed . Most of the data entry workers earn up to $250 per month from this website. PayPal, WebMoney, Payza, Western Union are some of the ways you can get paid from MegaTypers. ProTypers is a conglomerate of data entry specialists. This is another site where people earn as high as $200 a month by solving captcha images. People from all over the world can join ProTypers. Kolotibablo.com has been providing online jobs from home from last 5+ years & many of the people have received their payment on time. They pay up to $1 or even more per 1000 captcha images typed. Kolotibablo.com uses rating system to pay higher amount to their more efficient workers. More accuracy you show, more money you will receive. Initially, you need to work a little hard to earn money but with time, you will find a very profitable position on this website. FastTypers is the site which appreciate their great workers & pay them up to $1.5 per 1000 captchas. The rate of solving captcha will be higher during the night hours specially 12 am to 5 am. You can stay updated about their service through their blog. You can use this FastTypers link to join. Not only you earn $1 for every captcha images but you also receive some bonus for solving complicated images. Another way of earning here is throiugh referral system. You can see your earning as soon as you start working in 2Captcha. You can cashout through Payza if you reach $1. You can get paid weekly from QlinkGroup. Its a 2 words captcha service & the words are case sensitive. You have to type at least 800 captchas per week per ID to receive your payment. Many people all over the world work on CaptchaTypers & make around $200+ per month through captcha entering. If you want to join this site then you need to send an email to [email protected] & you will receive your login details for free. You need to type fast without timed out or else your id will be banned for 30 minutes. Their rate varies with the time. You will get maximum rates between 9 pm to 9 am. You can download the latest CaptchaTypers software from this link. Another best site for online captcha solving jobs that pay higher rates for every 1000 captcha solves. New registrations to the site has already been closed. You need to visit the site regularly to check if the registration is opened again. Captcha work is not something where you can make some big income. This is a laborious job & the money you make here is very less. You can earn around $100 to $300 (Rs. 6000/- to Rs. 20,000/-) per month if you work at least 4 hrs daily. Check other money making options here, if you are looking to earn some good income through internet. Some of the capthca work websites will ask you to download the software & you need to type the captchas after logged in to these software. You need to create your account on PayPal or Payza or other websites before you join these sites so that you can receive your earnings promptly. You must try all the websites up to minimum balance & check some of the things like who pays genuinely on time, where you are more comfortable to work & where you can make more money in less time. You can even search these types of jobs in many of the freelancing sites like Freelancer.com, Elance, Odesk etc. Many of the companies posts such jobs there on regular basis. Hope this article will help those who are not looking for big money making opportunities. This is a good online data entry job for you if even $100 is a very decent income for you. hello Jamie this is Arinet from Ethiopia. please, Jamie can you tell me where i can get an invitation code? or else can you send me the invitation code? i want to try this but how can i find my invitation code? I am willing in CAPTCHA jobs please help me. Hi sup it very nice here. I am Ikbal from India. i all ready read this page and i also interested the job of Captcha solving and online data entry . but how can i do that pleat tell me details about this jobs. my email allso registerd in your website. I want to try this, but how can i do that? What are the steps? Please help. I’m sasi. I would like to do online business.but i don’t have more knowledge about that. So can you explain about it. Hello, nagrale I’m working with 2captcha and also signed up with some other sites but my problem is low internet. I’m travelling from one place to another, my request is can u pls tell me the best portable pocket WiFi device that has 10-20mbps browsing speed. I’m Raza So i wanna Asking ??? Could you tell me about that Money . How can received I wanna Work in site ……. So plz Explain about that nowadays I’m living In UAE…………………..
Few days back i have signed up for megatypers but i’m rejected due to low typing speed. Now again i’m trying to sign up for megatypers and first time for protypers but it is showing that the email(paypal account) already used for another account. Actually my doubt is can’t we use same paypal account for different websites. Sir, im Usman Khan form Karachi. I want to buy complete online earning course, for captcha entering. So ican get a list of legit sites to start my work with. Looking desperately for the reply from you. I am not understanding something. We are told that we can register on any of the sites but yet still I am not able to register on any of the sites. I try to register on MegaTypers and it asked for a code which I was unable to supply since I am a just sigining up and no code was supply. I did not get to register. I try to register on ProTypers and was told that the email was already in the system. I don’t understand, how then am I to register if I am going to be blocked once I enter my email, did not get to register and then the system block me for trying again. Is it that you can only register for one of the websites? Why are you blocked even when you have not been able to complete the registration? and why there is not a system in place to make sure that the system recognise when a person is actually register from when they are not. My name is joseph from Kenya and I appreciate so much for your informative website on online jobs. I just want your help because am trying to register with MegaTypers and the site requests for an “invitation code” would I get that from you? There is a great opportunity for students, house wife, retired employees, insurance agents and for all by just doing Part time work from home by using whatsapp, Twitter, Facebook and other online marketing tools. I would like to express profound gratitude to this site for your assistance to me and rest, and I hope you could keep it up, and I will try the sites. can I do captchas job in India if so, what will be the payment mode as I dont have paypal account. C0CG for Mega Typers Invitation Code Everyone. Godbless ? DO NOT forget to share this guys. It’s FREE for all. I am deeply greatful to your website but as I try to register with MegaTypers is says that I need an “invitation code” would I get that from you? Use this code “BALJ” to earn money on MEGATYPERS. Awful online job that pays nothing. How can anyone live off of one to two hundred a month? For four hours of work a day? Hell no! This is like the stupid websites with surveys. Where is the real jobs that will make you one to two hundred dollars a day? Am really getting sick of the BS and these people taking peoples money and giving us nothing. So many scams. The only website I have ever made money on is writing my own e books and putting them on Amazon. Their new system is based on each page readers read instead of how many downloads. If you want to write books write ones that are 100 pages or longer and you will make more money from KDP. Also I made some money on Fiverr but beware that you could be working 12 hours on something if you promise too much upfront. Make sure to offer a lot more upgrades to your gig once they have ordered so you can make more money. Make $5 dollars as a base price. Then add additional things to make more. Most people request logo designs, articles, and video and audio presentations to represent businesses. There is a lot of competition but you can still get work if you put certain keywords in there and put in exact what people are looking for in the buyer request section. After a few hours or days you will get a response. Its better to do smaller task though and not waste hours of time. Also one other legit thing is affiliate marketing make sure to do a few courses on Udemy.com before going into it full time if your very new to it. This is where you can easily make 100 to 1000 dollars a day once its set up and you have your landing pages. You don’t need a website or blog but you should have some social media accounts. If you have any more questions just ask me. Hope this helps you. Have you been earning money with affiliate marketing? Do you have evidence that you can get paid 100 – 1000 a day as you have written? I’d appreciate if you can respond on that and make some more specific recommendations.